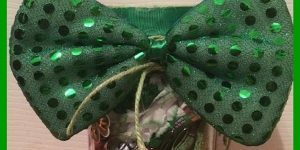 St. Patrick’s Day will be here before we know it, so it’s time to start thinking about all of the cute photo opportunities that present themselves on this fun holiday. 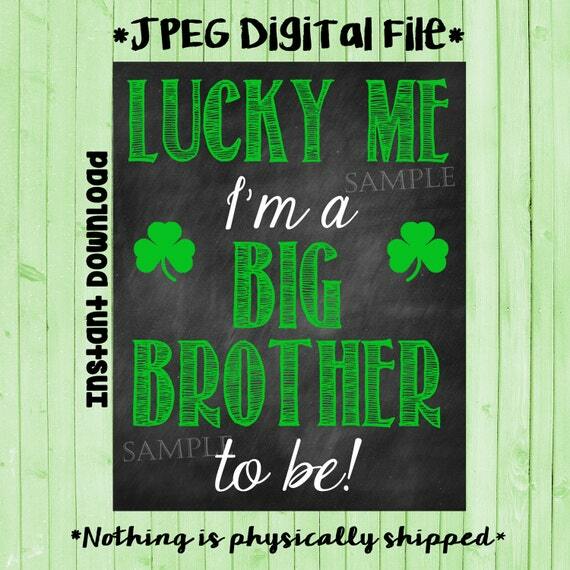 Whether you want to make a special announcement, such as new baby on the way, or take note of your first St. Patrick’s Day together, or just have some photo booth fun, several sellers on Etsy are offering cute St. Patrick’s Day printable photo props that you can download and print right from home. 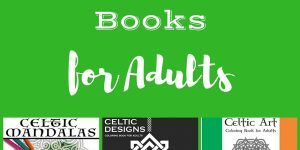 Here we explore some of these options that both kids and adults will love. You don’t even have to be Irish to enjoy these! This is a printable download delivered as a digital JPEG file, which you can print yourself or take to any photo printing retailer to have printed. This is a chalkboard style graphic and should be printed on white paper as the black background is part of the graphic. Formatted to fit an 11 inch by 14 inch poster, this sign reads ” Lucky Me I Am A Big Sister To Be!” with the baby’s last name and expected due date printed below. Green and white lettering with shamrock accents make it festive! Available as a digital download of one printable poster in JPEG format. Choose from three different sizes. 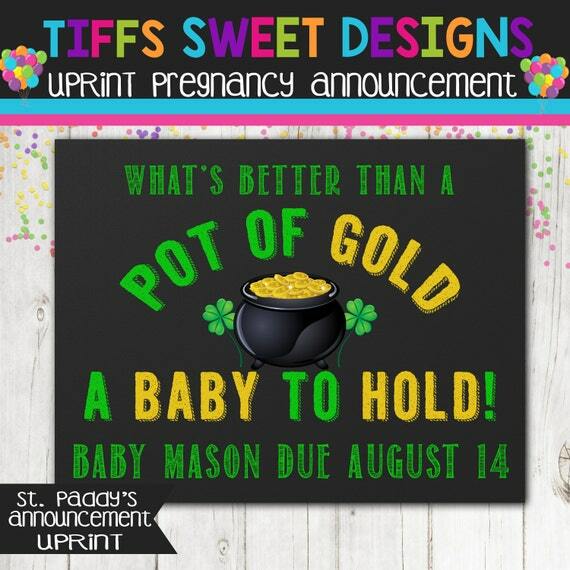 Design has black background with green and gold lettering that reads “What’s Better Than A Pot Of Gold, A Baby To Hold!” with a pot of gold in the center and baby’s last name and due date printed underneath. This design comes as an instant digital download of one JPEG file. 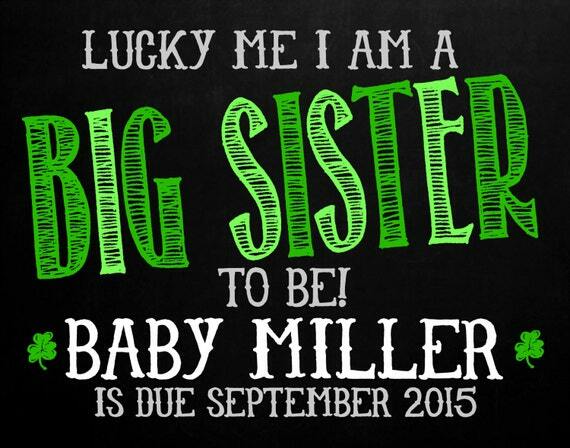 Black chalkboard style background with green and white lettering announces to the world “Lucky Me I’m A Big Brother to be!”, with green shamrocks as accents. Size measures 11 inches by 14 inches. Announce your baby’s first St. Patrick’s Day with this cute photo prop. Instant download of one JPG file. Design prints at an 8 inch by 10 inch size, with black chalkboard style background and green and white lettering with colorful green shamrocks. 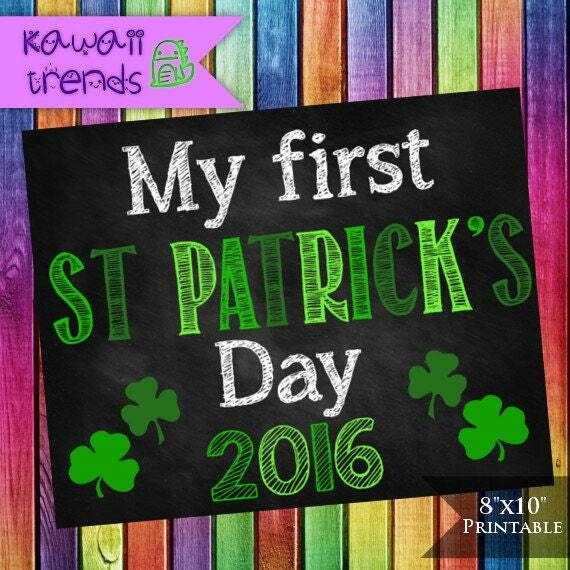 Celebrate your first St. Patrick’s Day as a couple, as a family, or perhaps use for twins or multiples. Take some photos to remember your special day with this fun and decorative sign. Instant digital download of one JPG image to create an 8 inch by 10 inch sign. 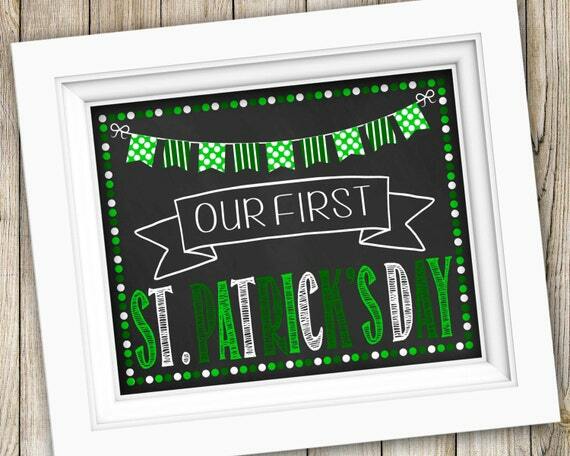 Design is a black chalkboard style with a green and white polka dot and striped banner gracing the top, along with the words “Or First St. Patrick’s Day.” Features cute dotted border in various shades of green and white. This set comes as an instant digital download of four ZIP files. Includes over 55 props including speech bubbles, lips, glasses, bow ties. mustaches, hats, masks, beards, ties, shamrocks, mugs, horseshoes, pots of gold, pipes, and more. 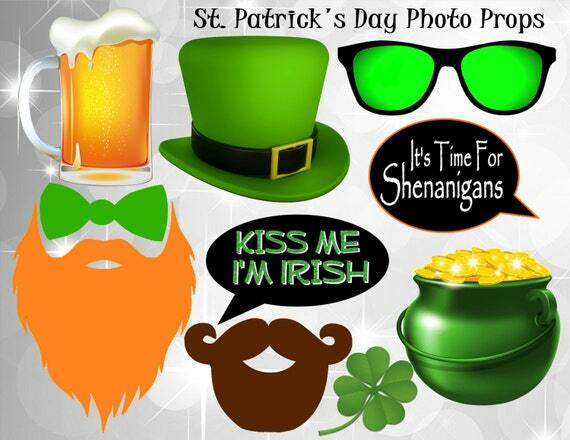 Create fun and silly photos for a memorable St. Patrick’s Day. Get everyone in on the fun at your St. Patrick’s day gathering, from youngest to oldest. 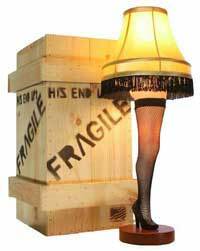 Everyone will have a blast creating funny photo memories with these fun props. Set up a staged photo booth, or just have your guests choose their favorite props and start taking pics. These are sure to be a big hit! This includes an instant digital download of one PDF file. All products are split between six pages. 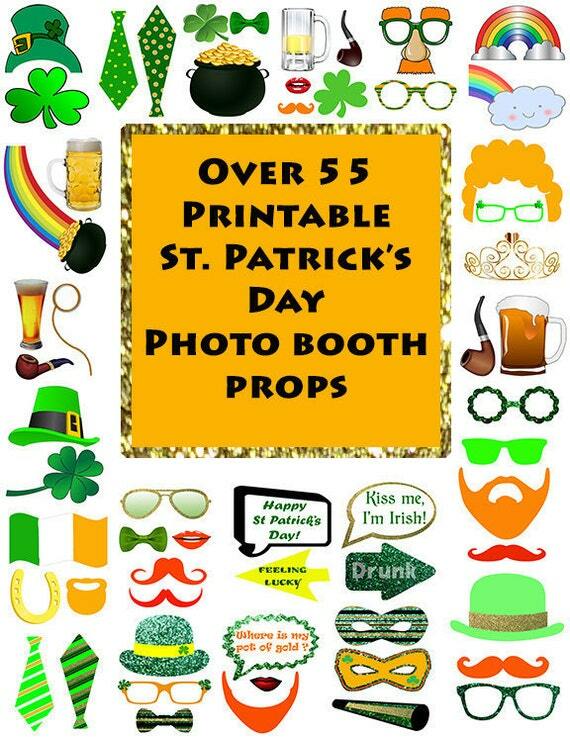 Print from home St Patrick’s Day Party Printable Photo booth Props to make your own cool photo props. Set includes a red beard, beer mug, top hat, brown beard, green bow tie, shamrock, speech bubbles and pot of gold. Speech bubbles say “Kiss Me I’m Irish” and “It’s Time For Shenanigans.” Both kids and adults will enjoy getting in on the St. Patrick’s Day photo fun and creating silly memories to last a lifetime. This is an instant digital download of two PDF files, one sizes 36 inches by 24 inches and one sized 36 inches by 54 inches with each having a cut out area for the face. 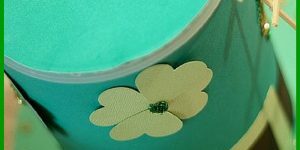 Create funny St. Patrick’s Day memories with this cute prop, making your own face the face of the leprechaun. 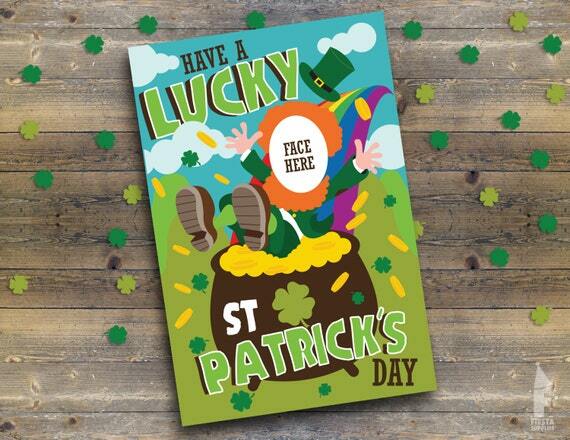 Colorful photo prop depicts a leprechaun falling into a large pot of gold, with the words “Have a Lucky St. Patrick’s Day.” Set up a funny photo booth for either adults or kids and have everyone take silly photos to remember all the fun you had! Share your baby news with this cute sign available as a printable JPG file download. This design can be printed in various sizes of your choosing, not only to create photo props, but perhaps pregnancy announcements or baby shower invitations a well. Design is done in a black chalkboard style with green and white lettering. 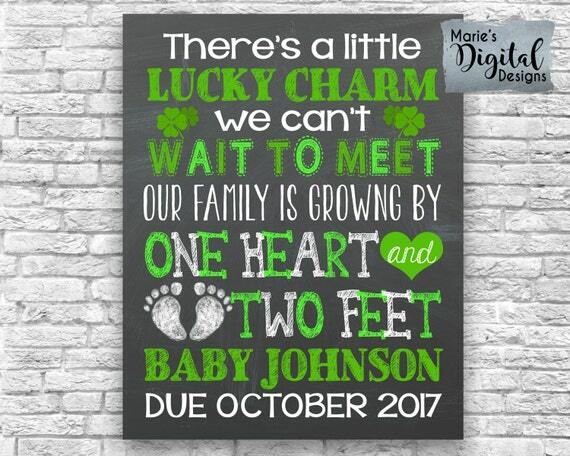 Sign reads “There’s a little lucky charm we can’t wait to meet, our family is growing by one heart and two feet,” with the baby’s last name and expected due date. Design features two little baby footprints to add to the charm. Set comes as an instant digital download of one PDF file. 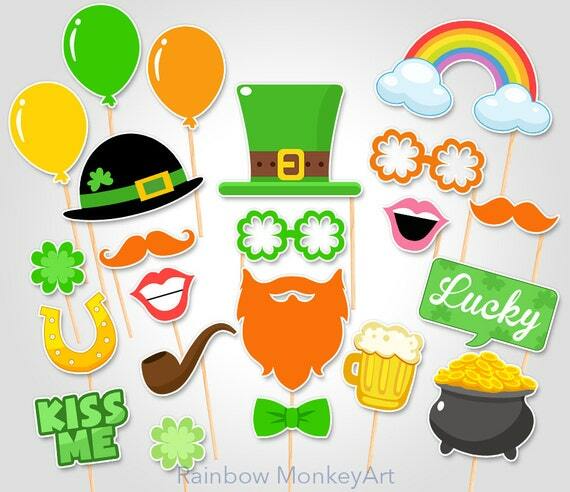 Set contains 22 colorful designs which include a Leprechaun hat, shamrock glasses, shamrocks, balloons, black hat, rainbow, pot of gold, “kiss me” sign, “Lucky” sign, pipe, horsehoe, bow ties, beard, balloons, beer, and more. 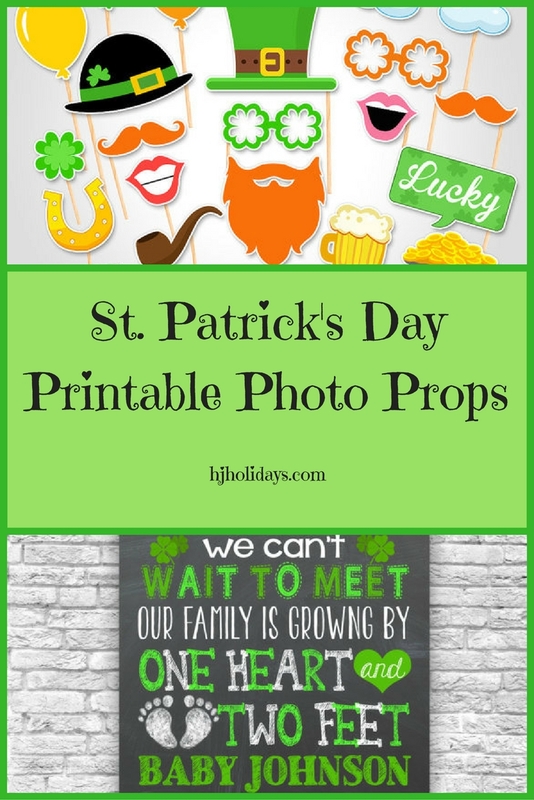 Create fun photo memories with these fun St. Patrick’s Day printable photo props. Fun idea for either a kids party or adult party and a great way to get everyone involved in the celebration.